Sneinton Alchemy trained Community Organisers have gone to to set up NOMAD, a newly established community group with the aim of “breathing life” into and promoting area pride in neighbourhoods across Nottingham. organising community events that both focus on bringing people together while encouraging interactivity, Music, Arts and Dance. carrying out on going consultation/engagement with the local residents, businesses and the general public in order to work out what can be done to improve our neighbourhoods. offering a range of training opportunities to local businesses with courses relevant to growing their business. The group is made up from 3 active community organisers that also have a wealth of experience in teaching and event organising. NOMAD enables all 3 of the founders to do what they love in full: A combination of event organising, a love for the Arts and a love of Community Organising. They have come together with a shared vision to bring people together (facilitate community cohesion) sometimes seeking creative solutions. One of their many mottos is to "breathe life into "?.. The members of the group also hold a shared love for the Sneinton Market Square and a shared concern that with the space being underused by the community it may begin to become the refuge of undesirables, drug users and alcoholics. As the members all live or work in Sneinton the Sneinton Market Square is the natural place to start. It is an ideal location to aid cohesion and collaboration between the residents living in Nottingham's Area 6. 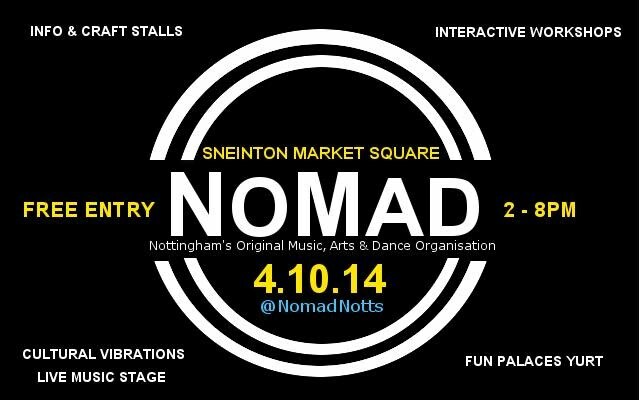 NOMAD aims to facilitate a series of interactive community events celebrating the creativity & cultural diversity of Nottingham city. For the launch event they have teamed with FunPalaces (celebrating its centenary on October 4th-). Fun Palaces are about fun and learning, participating and making together: a space where arts and sciences meet. For updates on NOMAD or to get involved send a message to steve.smith@sneinton-alchemy.com or you can find NOMAD on facebook and twitter @NOMADNOTTS or see our sponsorship pack below.